Sokoa keeps going with its world tour. After exposing during four days at the Workspace at Index in Dubai, the French export and marketing team is travelling to Chicago in USA where they will expose at the NeoCon with a 30m² booth. It will be located in the 7th floor of the impressive building which hosts the fair for 46 years. In some key figures Neocon are 300,000 m² of showroom and exhibition space, 750 exhibitors, 40 000 visitors, more than 100 conferences and 50 shows. Like in Middle East the brand will present the M4, the K01, the Wi-MAX, the Sedna, and the Citizen and the E7 from Eurosit. So please feel free to visit us from the 9th to the 11th on June at the booth 7-2015. 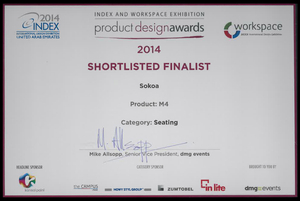 That was also the first time for Sokoa in the Workspace in Dubai and the export managers made a good assessment. “The products we presented received a warm welcome; especially the M4, which has been shortlisted for the Workspace Product Design Award”.